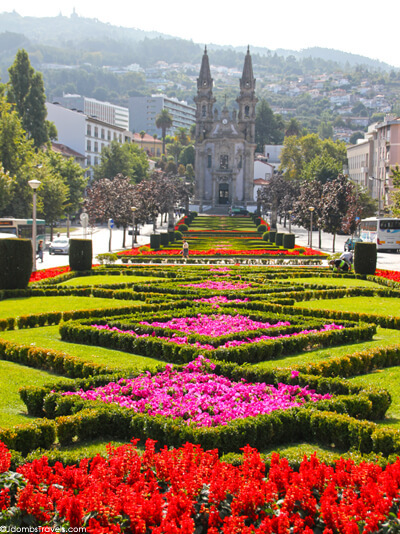 Guimarães was my favorite city I visited on my tour of northern Portugal. Perhaps it was because this is where I spent the most amount of time, though I really only began to scratch the surface. Unfortunately, our bus broke down en-route from Pinhao in the Douro Valley to Guimarães. The time we were stranded on the side of the freeway took away from more time we would have had to explore Guimarães. But I still got a taste for the traditional sights on a walking tour of Guimarães, which was also the 2012 European Capital of Culture at the time of my visit. 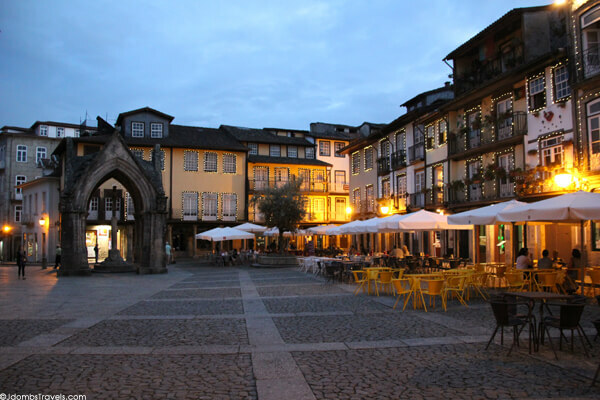 My first real glimpse of Guimarães was of Santiago Square on our twilight walk to dinner. Still maintaining its Medieval aspects, the square is home to the Church of N. Sra. da Oliveira, the Salado Memorial, and the Old Council Chambers. The Salado Monument commemorates the 1340 Battle of Salado. Long ago fountains actually served a purpose. Once used to provide drinking water and bathing or washing to residents, over time fountains came to be just for decoration. Nowadays you can even be fined if caught bathing or frolicking in a fountain. Guimarães returned function to fountains by turning five of their fountains into public swimming pools complete with life preservers for the summer. I came across a few of the fountains turned pools at night, so no one was swimming, but I was assured residents took advantage of them to beat the heat all throughout the summer. I’ve visited my fair share of castles around Europe, but I was bowled over by the beauty of the 10th century Guimarães Castle standing majestically on the hillside. The original castle was built to protect the monks and Christian community against attacks by the Moors and Normans. In the 12th century, Count D. Henrique and Countess D. Teresa took up residence in the castle after enlarging and strengthening it. Various kings contributed to further improving the castle from the 13th to 15th centuries, before it finally was abandoned and fell into decline. After it was declared a national monument in the 20th century, the castle was completely restored. Though I didn’t have time to go inside the castle on my visit, the day was one of those perfect, sunny days with puffy white clouds perfectly framing the imposing castle on the hill. Nearby, we got a treat as the Mayor himself headed in to his office at Guimarães Town Hall. 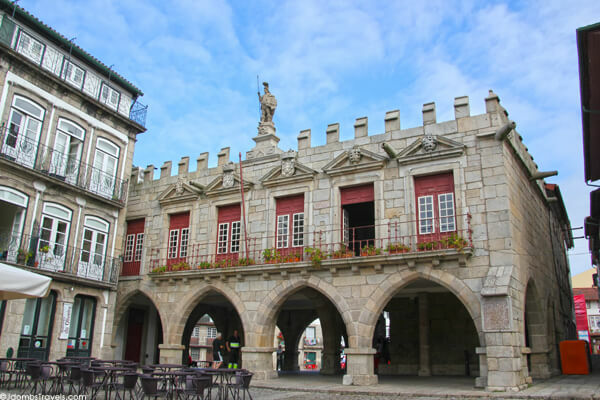 The Town Hall was converted from the former Convent of Santa Clara (much like the Pousada Santa Marinha was converted to a hotel from a former convent), once one of the richest convents in Guimarães. Some of the gilt carvings that remain from its chapel are now on display in the Albert Sampaio Museum. There are statues of King Dom Afonso Henriques, the first king of Portugal, around the city. I particularly liked this one by by João Cutileiro. Outside of the city walls, with a long row of beautiful gardens leading to it, is the 18th century Church of São Gualter. The twin spires were not part of the original design and were added in the 19th century. Because of the spires’ height, the church was the first in Guimarães to be equipped with a lightning conductor. Church of N. Sra. da Oliveira is open 8:30am – 12pm and 3:30pm – 7:30pm. Free entry. 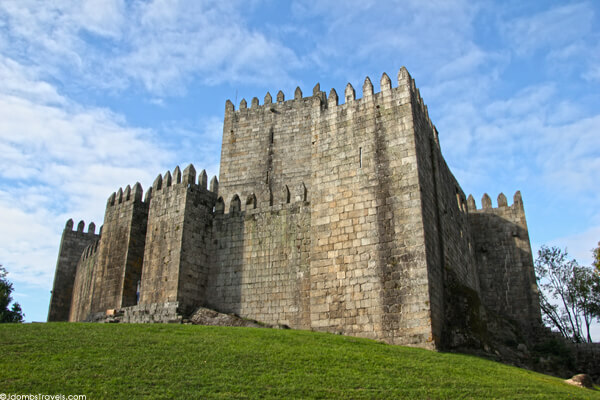 Guimarães Castle is open daily 10am – 6pm. Free entry. Church of Santa Gualter is open Monday through Saturday 7:30am – 12pm and 3pm – 5pm and on Sunday 7:30am – 12pm. Free entry. Thank to you Turismo de Portugal for hosting me. As always, all opinions are my own.